Researchers have been left scratching their heads after a seal was found with an eel stuck up its nose in the north-western Hawaiian Islands. An image taken this year of the seal’s predicament was shared earlier this week by the National Oceanic and Atmospheric Administration (NOAA), which said it had seen the phenomenon three or four times. 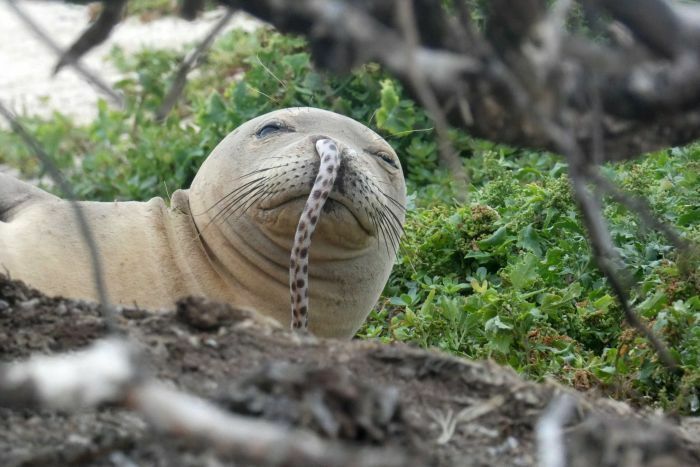 “In the nearly 40 years that we have been working to monitor and protect endangered Hawaiian monk seals, we have only started seeing ‘eels in noses’ in the last few years,” it said. Researchers said the eel may have gotten stuck trying to escape — Hawaiian monk seals forage by shoving their mouths and noses into coral reef crevasses, under rocks or into sand, looking for prey that like to hide. Another option was the seal — which often throws up food — swallowed and then regurgitated the eel so it came out the wrong way. The NOAA has since developed guidelines on how to remove the eels, after researchers first spotted one stuck in 2016. “They get stuck in there really snug, so you have to restrain the seal and give the eel a firm tug to get it out,” The Guardian reported the NOAA’s lead scientist Charles Littnan as saying. The NOAA said all seals since caught in the “slippery situation” had been caught and the eels removed. None of the eels have survived. Next articleCan Kyrie Irving Get Some Help?